This colorful small foam-padded bag is perfect for carrying and quickly accessing an ultra-thin digital camera. The flap top allows fast access to the camera. 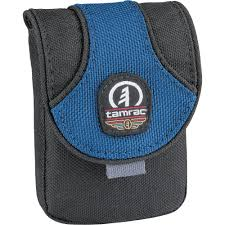 A small front pocket provides space to carry an extra memory card or battery. This sporty bag is designed to fit in any purse or backpack or can be worn on a belt loop for secure transport.